An entheogenic report of Anadenanthera Colubrina. I first heard about the Anadenanthera Colubrina seeds through an anthropology documentary. 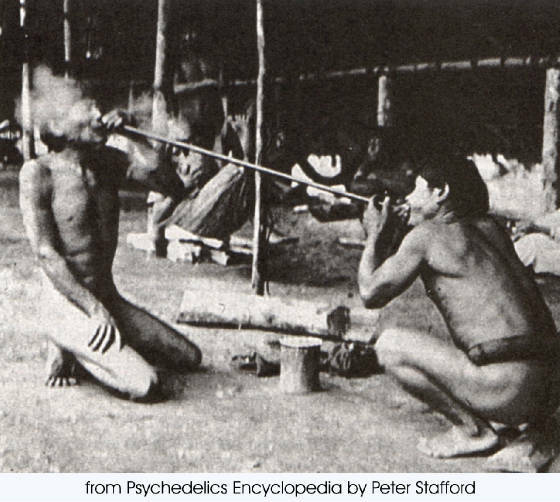 Watching Shaman using the snuff, I thought to myself this is something I have to try (already being a tobacco snuff user). I purchased a 25g bag of seeds from an online vendor, and anticipated their arrival greatly, when they came I followed the traditional method of making Vilca, the seeds were dry fried until they popped like popcorn, they were then deshelled and pounded to a fine powder in my pestle and mortar, I mixed in at a three to one ratio some sodium bicarbonate, then mixed and pounded the matter again into an even finer snuff powder. I left this mixture in an small air tight container for around two weeks, until I felt ready to experience its effects. The time came when one evening I decided to work with this substance. I opened out two medium lines on a piece of A4 paper and snorted both lines into each nostril, and then woosh! Oh what pain, only just bearable. I placed myself on my bed, my heart was thumping very hard and I experienced a huge adrenaline rush, with intense energy running through my system. I was listening to some wonderful ambient music through headphones which really helped I think. I closed my eyes and opened them again, and my entire room seemed very linear and grey, and the walls were slowly and steadily breathing and pulsating. Then i closed my eyes again and I felt as though I was being strangely spun around backwards and forwards. I then had a few various closed eye visuals of a brightly coloured python like serpent which seemed to jump out at me, and as it did I opened my eyes yet again, and was greeted by a still picture of the face of Che Guevara floating across my room. This was the high point of my visions, and I afterward came down to a very pleasent high. The entire journey lasted no longer than 30 to 40 minutes. And the next morning I felt wonderfully refreshed and very happy. This was an experience I was very pleased to have, and something that will stay with me for long time.